After two drug counselors at a Chester County halfway house were found unresponsive Sunday afternoon, toxicology reports later found a deadly drug cocktail in their system: heroin and its synthetic brother, fentanyl. Attempts to revive the counselors with the opioid overdose antidote naloxone were unsuccessful, and they died at the scene. Fentanyl has been widely categorized by local, state and federal health officials as the latest wrench in the fight against the opioid crisis. It's potency is reported to be about 50 times stronger than morphine, and its prevalence among Pennsylvania's total opioid overdoses increased by nearly 100 percent in 2015. "It's just a lot more potent," said Dr. Jeanmarie Perrone, a professor of emergency medicine and director of toxicology at the University of Pennsylvania. To make things worse, many users aren't aware of just how powerful it is. For others, they may not even be aware they're taking it, as it's frequently used as a cutting agent by drug dealers looking for a marketing edge. For heroin users whose bodies are accustomed to X amount, the addition of fentanyl into a batch can rapidly accelerate the effects of the high, which often leads to deadly results. "One of the dangers of fentanyl is a lot of people who go to use it are not familiar with the dosing," said Dr. David Vearrier, a toxicologist who works in the emergency department at Drexel hospitals. "They know they use seven bags of heroin, but not with fentanyl." While fentanyl and heroin act very similarly once inside the body, they have completely distinct structures. Heroin is made from morphine, a natural opium product, while fentanyl is synthetically produced. Fentanyl is designed to bind more tightly to the body's opioid receptors, offering considerable pain relief to those who are prescribed it. 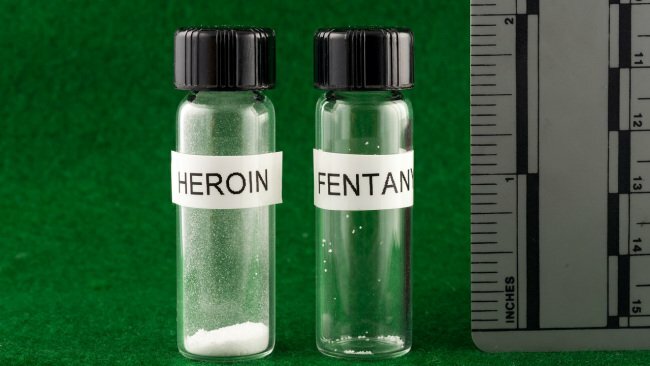 The drug's structural properties also mean that a much smaller amount can lead to overdose, as illustrated by a photo released last year by the New Hampshire State Police Forensic Laboratory. From an economic perspective, it's hard to sell something in such small quantities. So it's used to make heroin stronger, and therefore a more attractive product. "You can't sell something that’s a tiny, tiny drug. It's too hard to handle," said Perrone. "To my knowledge people are trying to use normal heroin, and getting something more potent." Some do consume fentanyl on its own, but that obviously leads to its own set of devastating results. Fentanyl patches, for example, are designed to slowly release small amounts of the drug into the bloodstream of a person suffering from severe pain. The patches contain, as Vearrier put it, a "ridiculous" amount of the drug. Addicts who are unfamiliar with the high potency of small doses will frequently try methods like putting a patch into a hot water to make a tea, or just ingesting it whole. "People who try and abuse the patch unknowingly taking an inadvertently large amount of the drug that will almost certainly lead to overdose and death," Vearrier said. Those suffering from opioid addiction are trying to reach a pinnacle of euphoria – a "twilight" state of mind, as Vearrier described it. Fentanyl gets a user there much quicker, but therefore can more rapidly push someone over the edge to respiratory depression, or to the point where their brain or heart stops operating and he or she stops breathing. "Fentanyl is just so unpredictable of how much you're getting," Vearrier said.